Scarecrow (2018) by Every house has a door, directed by Lin Hixson, performed at Mad House, Helsinki, Finland. Pictured left to right: Ahti Leppänen, Colin Hunter, Matthew Goulish, Essi Kausalainen, Emelie Hunter. In this international collaboration, Every house has a door and Finnish artist Essi Kausalainen, along with local child performers weave a circuit of language, gesture, video, and elaborate costumes around common interests of inter-species communication, human-plant and human-animal relations, and the slow progress of the snail. We began work on this performance collaboration during a residency at the Robert Rauschenberg Foundation’s estate on Captiva Island, FL in November and December 2016. With Lin Hixson directing, and Matthew Goulish and Essi Kausalainen performing as well as contributing writing, choreography, costumes, and video, the work proceeds from common interests in inter-species communication (human, plant, animal). Essi wrote, “My ten-year artistic collaboration with plants has redefined my relationship with artistic ‘materials,’ my own body and those of others. I have learned to see myself as a community, an open process that is constantly taking place relative to another.” Essi’s choreographic poetry and humor provides a starting point for a circuit of research, language, and gesture, with snail-derived choreography, the deleted dance of the Scarecrow in The Wizard of Oz, and the Pink Floyd song Scarecrow. 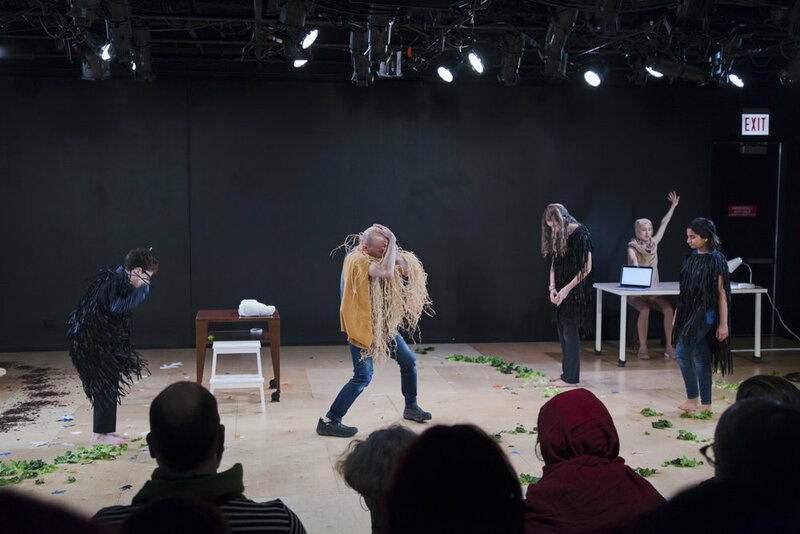 This project furthers our investigation into post-human themes and their direct translation into performance; that is, human collaborations (potential and actual) with plants and animals. Current philosophy dialogues rethink the human place in the world, and these questions have found their way into contemporary art. We want to afford our company and audiences more direct engagement with these themes, and the interface between the human and other life forms. The scarecrow of our title presented itself in the writing of contemporary American philosopher Alva Noë who proposed this human replica as a humble form of inter-species communication. Scarecrow has been presented at MAD House Helsinki and the Alfred ve dvoře Theatre in Prague co-produced with Handa Gote Research & Development. In Chicago Scarecrow was presented as part of Steppenwolf’s LookOut Series with three sold out performances. This project was made possible by support from the Trust for Mutual Understanding, Sector 2337 Chicago, Arts Promotion Centre Finland, Frame Finland, The Robert Rauschenberg Foundation, The MacArthur Funds for Art and Culture and the Richard H. Driehaus Foundation. Scarecrow (2018) at Alfred ve dvoře Theatre, Prague, Czech Republic. Pictured left to right: Matthew Goulish, Essi Kausalainen.